How do you truly know if you are a good person? It’s easy to tell ourselves that we are good people. We are kind to others, we donate to charity, and we haven’t physically hurt another person. Do we deserve a pat on the back for that? Can we truly look ourselves in the mirror and say ‘yes, I am a good person’? These are the questions ‘An Innocent Guy’ asks, a short comic story that is featured at the end of Batman: The Killing Joke Deluxe hardcover edition. If you’re a fan of The Killing Joke and don’t have this edition, I strongly suggest purchasing it. Not only do you get the amazing Killing Joke story looking as beautiful as ever, you also get this wonderful additional story written and illustrated by Brian Bolland (Also the art on the cover of this edition, that is on the physical book, not the slipcover, is amazing!). “Man is condemned to be free; because once thrown into the world, he is responsible for everything he does.” – Jean Paul Sartre. We are born with free will and we are allowed to make choices that will reverberate through time forever. So now he’s got a problem. What will his bad act be? He wants it to be something big! But wants it to be something random that won’t give him motive. He’s just a normal, everyday guy. He hasn’t committed any crimes before, and he wants someone that is convenient to kill. His choice. Batman of course! There are thousands of other people that could have greater motive for killing Batman than he does, it’s an easy choice. 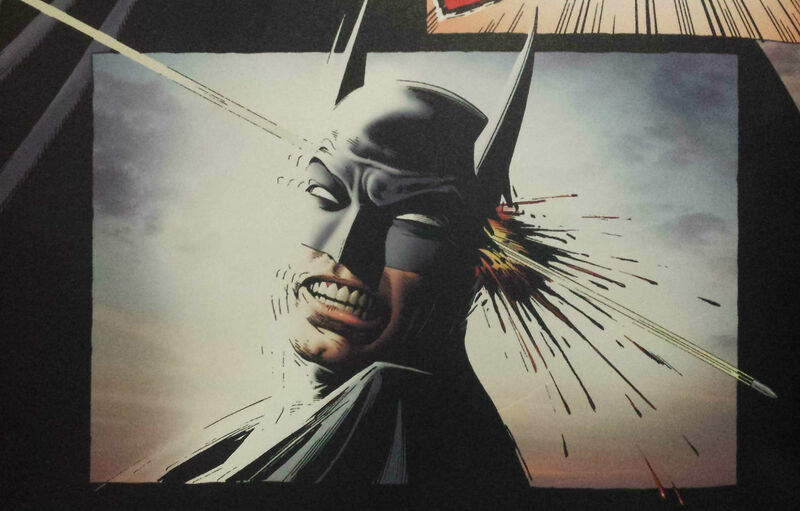 So he loads up his gun, waits for the right moment, and he shoots Batman through the head. He also says that he will miss Batman (err that’s nice huh). Clearly he has decided that he likes being good over being bad. Therefore in his mind he is a good person. This story evolves into a powerful philosophical and ideological discussion. The “Innocent Guy” in this story may look and seem a little crazy, but his train of thought isn’t all that insane. And no I’m not saying that we should all go out and kill Batman to find out whether we are good people, but we should consider the reasons behind our actions. Because the ‘Innocent Guy’ in the story understands that it’s easy for us to get other individuals and organisations to make moral and ethical judgments on our behalf. It’s easier than thinking for ourselves. But at the end of the day, we can’t find out who we truly are as a person, until we make a disconnection with the ideals and values the world is telling us, and develop our own. The ‘Innocent Guy’ in this story may not be so innocent anymore, but at least he has in a way grasped a greater sense of self. I love this story for the ideas it discusses surrounding morality and self-judgement. Just like Batman: The Killing Joke, which I will have to write a discussion about as well (you can find the Killing Joke post here), An Innocent Guy discusses intriguing aspects of the human psyche, which is why I personally loved it so much. I’m a sucker for stories like this, and it was a great little treat to read after reading Batman: The Killing Joke. 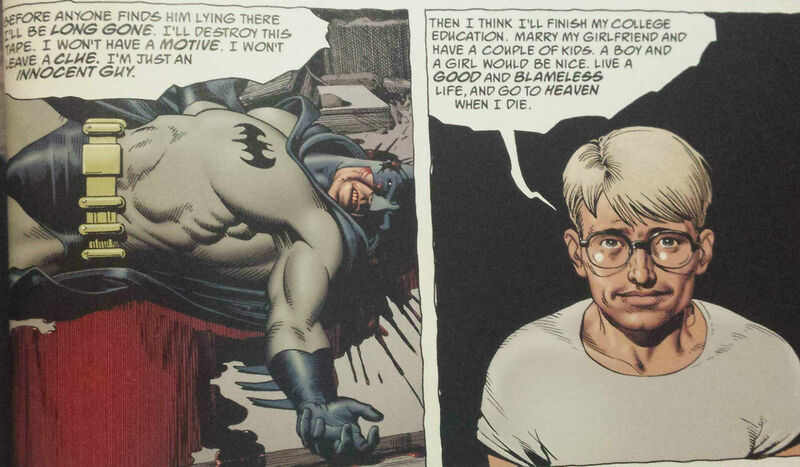 So if you haven’t read this short story, or if you haven’t *gasp* read The Killing Joke, please please please do it! It will really get you thinking about the themes and values behind them for hours after reading it, which every great story should do. So have you read ‘An Innocent Guy’? If so what did you think? And what did you think about the issues it discusses in the story? Let me know! Tip of advice for Gotham: Subtlety is key. That story worth the innocent guy is great! But I don’t know what it has to do with a killing joke. It was supposed to be an afterword for the killing joke right?bits supposed to be what happened after the killing joke. And as far as I know batman is alive but this guy killed him so I’m really confused on what the point of this story was. Because it would make the killing joke not canon because batman never dies. Idk I’m confused someone help me. I meant With not worth at the beginning. It’s not part of canon or anything, it’s just a side story the artist wrote to accompany to book. do u think it’s possible that the innocent guy may in fact be the joker’s origin story? But this story is about right vs wrong and what makes someone good. The way I see it, The “innocent guy” here is far, far from innocent. He’s really a total self-obsessed psychopath. He wants to do something bad, for *himself*. He’s endangering all of Gotham by killing Batman. But that’s still just him trying out being bad. To me, the reason this guy isn’t just some nice guy with an existential crisis is what he says at the end “I’m just an innocent guy. Then I’ll finish my college education. Marry my girlfriend…Live a good and blameless life. And go to heaven when I die”. He says this like it’s the “good” thing to do, like nothing has changed. But it has. He doesn’t tell the cops that he killed Batman. After what he did, the only good thing to do would be to admit his crime, and he doesn’t. He says he’s good because he knows what being bad feels like and he chooses good, but he doesn’t choose good at all. and how would it do that? is the innocent guy bit an indirect indication that batman killed the joker ? like in those last panels in the book batman realises the joker is far from salvageable and batman decides to be bad for the first and last time … maybe the innocent guy is like a representation of batman’s psyche ? I read it months ago & read it again tonight. Damn, it’s awesome in such a weirdly wonderful way. Did they write any similar shorts? just read these both for the first time. def a mind blower. does really make you think.. which is why i read it all over again 3 times. i like in the comments tht someone mentioned it being an indirect indication tht batman did kill the joker. that also kinda makes me think… it all really is a joke. Just read the killing joke and the innocent guy. The first thought I had after the innocent guy was that he represents normal comic book lovers/readers. Because, they are not evil, and do not have any of the traits comic book villains do. They are just “normal.” And in reality, they are the only ones capable of ending batman. Of course, they’ll still miss him but they were his downfall because they neglected him (in a hypothetical future). Part of the reason I think this is because I have seen so much angst and disrespect toward DC movies as if people literally want DC to stop making movies. This would in turn hurt the whole franchise and eventually “kill” batman. Just a theory I guess. Well I mean this story was put out before all this DCEU stuff, but the beauty of fiction is that you can take your own meaning from it, so it’s a cool interpretation! Was this made before the Batman Animated Series? Because I would like to think that while the discussion this innocent guy brings about is worth analysing, I can already see a flaw in what he is doing – and its based on an episode where Batman is seemingly ‘killed’ by a nobody and not one of the Rogues in Batman’s gallery. Yes this innocent guy will erase as much evidence as he can so he vanish… but just like the lucky chap in that animated episode, there will no doubt be people hunting him – and not just the cops but the Rogues themselves. After all, for the Joker, he cannot simply be who he is without Batman; not sure how the other Rogues will think though but maybe along similar lines in which the game doesn’t feel the same. So essentially in killing Batman in doing this innocuous thing, he’s putting a target on the backs of not just him but also on his future family – it may not be a big target, per se, but it’ll be something that will weigh him (and other innocents like him) down heavily.